Artist George Wright presents Soviet Captain Orset Chevstov with his painting of workers unloading tanks at Archangel or Murmansk. Wright, an American merchant seaman, was one of scores of artists in the Merchant Marine. Some had formal art training but many created paintings, drawings, and sculpture to pass the time on long sea voyages. The United Seaman's Service and the War Shipping Administration exhibited selected works of merchant seaman in an annual national tour of the United States. Some of the artists' works were included after the creators had been killed in action. The November 28, 1943 Washington Post article that covered the second annual exhibition said, "Most of it was executed on land, a good bit of it in Seaman's rest centers. But some of it was done at sea." 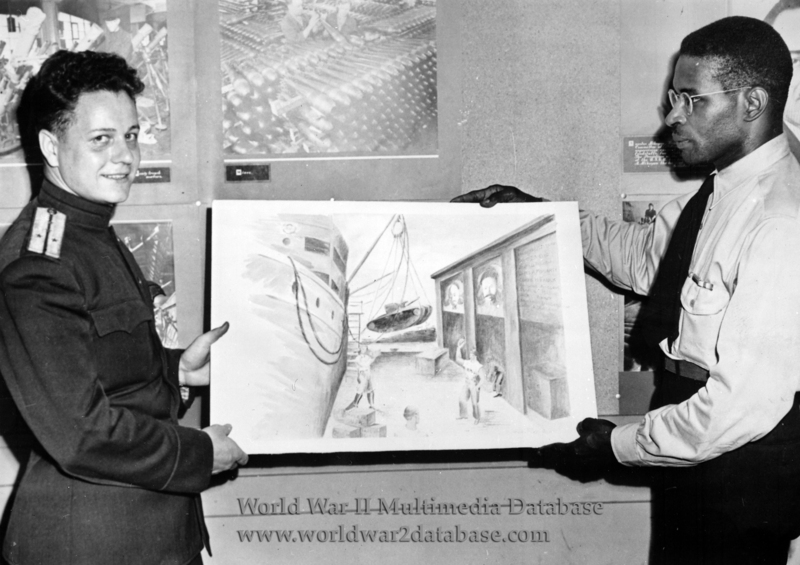 Mrs. Isabel F. Peterson, the "Chairman of the Exhibition Committee," told the Christian Science Monitor on December 21, 1944, "Conditions for painting at sea are not as ideal as you might think. The enormous volume of war cargo carried by our merchant ships limits space for the crew and makes privacy and the opportunity for concentration practically impossible. But despite the obstacles, merchant seaman artists somehow manage to produce. Because of the nature of their work, which is to traverse dangerous seas, they experienced emotional reactions to a great degree. And because they are naturally adept with their hands, more and more of them are turning to art for emotional relief and self-expression. This is shown by the attendance in art classes in several ports." The exhibits excluded paintings and drawings that graphically portrayed combat at sea, especially death of United Nations sailors. The United Seaman's Service also promoted a photography exhibition that honored journalists who photographed the Merchant Marine. The Office of War Information used events like these to promote Soviet-American relations; the "Murmansk Run" caught popular public opinion for its dangerous path through U-boat infested arctic waters.